Good Camping Recipes are a Must! 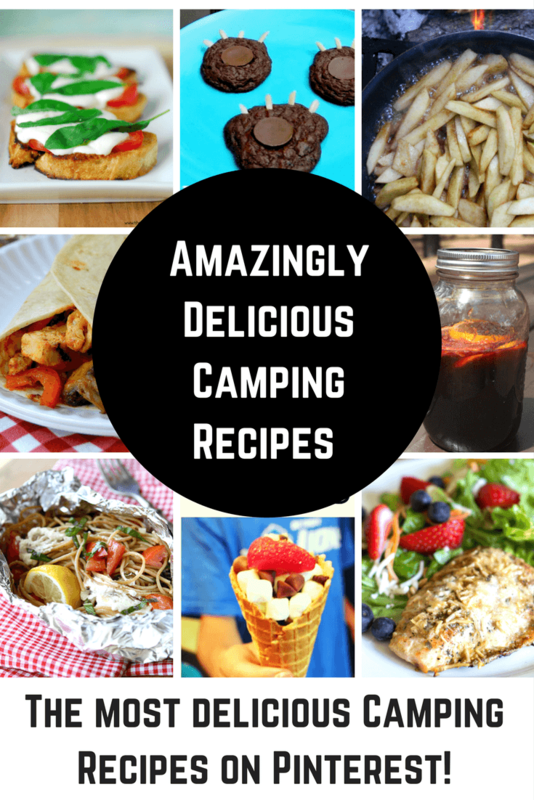 These recipes will make your next camping adventure extra yummy! There are so many aspects of camping that we love. One of the things I love about camping is how much fun it is to cook in the great outdoors! 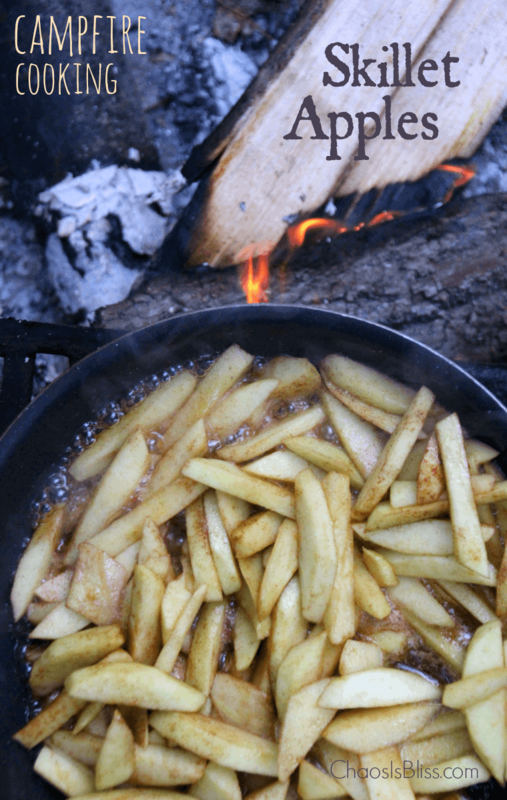 I love these wondering camping recipes and cannot wait to try some of them out this summer. Camping can be so much fun. There is nothing like being in the great outdoors, breathing in the fresh air and going on so many adventures. I have always believed that you can teach your kids so much by camping. They will gain a new appreciation for the outdoors, explore places that they would have never seen before, they even learn a few survival skills along the way. I’m all about a fun camping trip with friends and family, but I have to admit I’m always open to new ideas and any way to make the trip a little easier. Remember my camping hacks post? I also think the food that we eat while camping can be so fun. 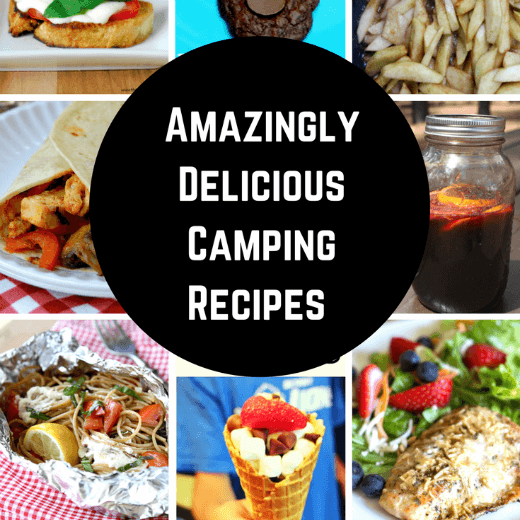 You can try new things and that amps up the adventure , even in a small way, Today I want to share a few recipes that I know will make your next camping adventure extra yummy! Are you ready for some highly portable and highly delicious food options for that next adventure of yours? 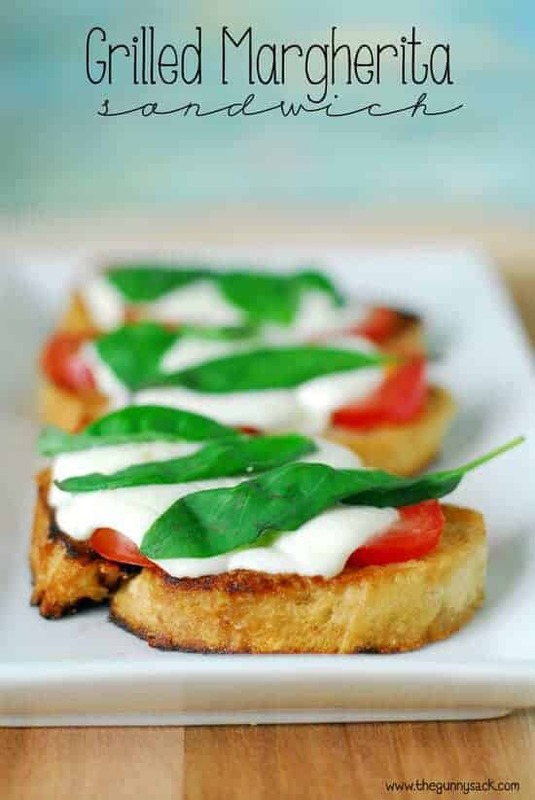 These Grilled Margherita Sandwiches may look like fancy, just look at those colors, but they are actually quite simple to make. The Gunny Sack shows us how bringing a few basic ingredients and a cast iron skillet can really up your camp cooking game. I love that you can throw a few things in the cooler and have a fresh tasting and scrumptious meal with very little clean up. That is my kind of camp cooking! Here on Princess Pinky Girl I share tons of recipes. Some of them my family love, love, loves. These Campfire Cones are definitely one of them! They are are like little cones of heavenly delight. If you love s’mores, but hate the sticky mess, this is the perfect recipe for you. You can load up your cone with your choice of fun toppings like chocolate, marshmallows, peanut butter cups, fruit… really anything and then you wrap them and grill them. Trust me they are a hit every single time we make them. 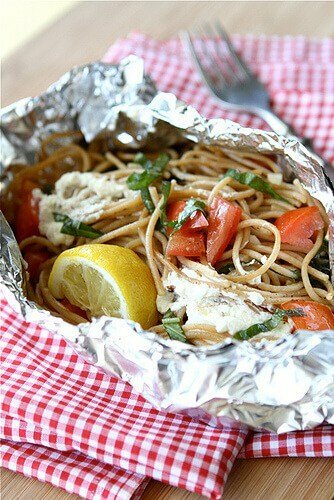 Whole wheat pasta in foil recipe with goat cheese & tomatoes… for camping! You can totally have a healthy meal when you are in the forest or on the shore. The Cookin Canuk shows us how to make a scrumptious pasta recipe that is easy to do, just break out the tin foil, fill it up and cook! This beats hot dogs any day, especially if you will be camping for more than just one night. Have you ever heard of a pie iron? 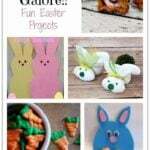 You have to check them out here! This recipe from Nap Time Creations for Cheeseburger Pie is cooked over the campfire and looks yummy and is a crazy fun spin on a hamburger. While you are over there, be sure to check out her other fun ideas for pie iron recipes. They use it all the time and I can’t wait to get one and try it out! 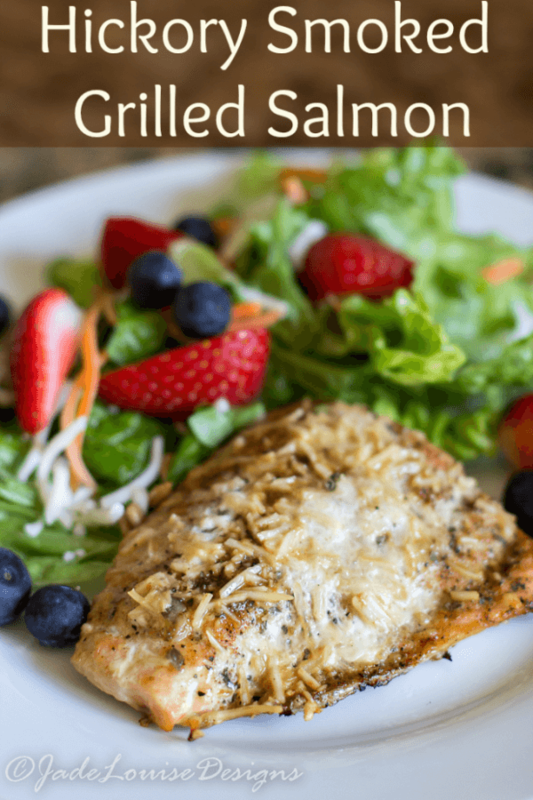 Believe it or not, this hickory smoked grilled salmon is actually a great recipe for camping! Doesn’t it look so delicious? Busy Creating Memories shared this beauty and the greatest thing about it is that you don’t have to be camping to make this savory dish. I can almost smell this one cooking just by the pictures. 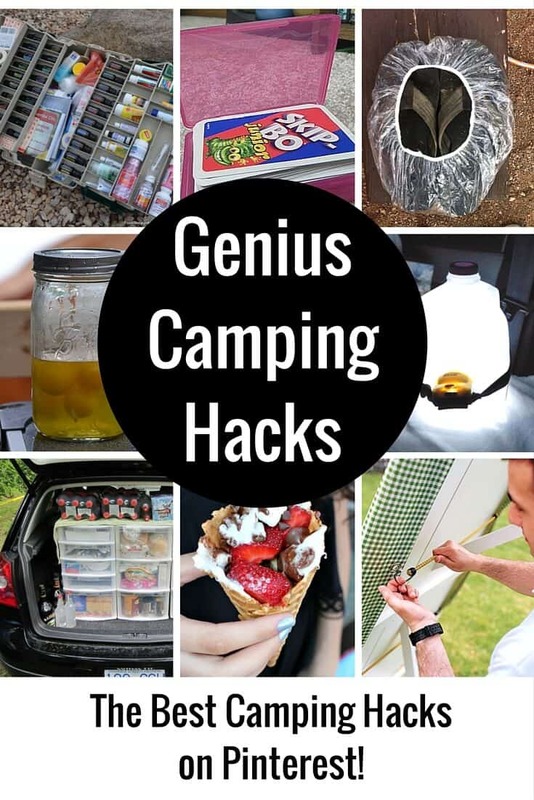 She also has some great camping tips on her site, too! Break out that skillet because it is time to make some sweets around the campfire. These campfire skillet apples by Chaos is Bliss look amazing. They would be so good for something to satisfy your sweet tooth and also serve as a good side dish for campfire cooking. Just look at all that bubbling sweet goodness! I am literally drooling over these right now! I think foil packet meals are genius and they make camp cooking a breeze. 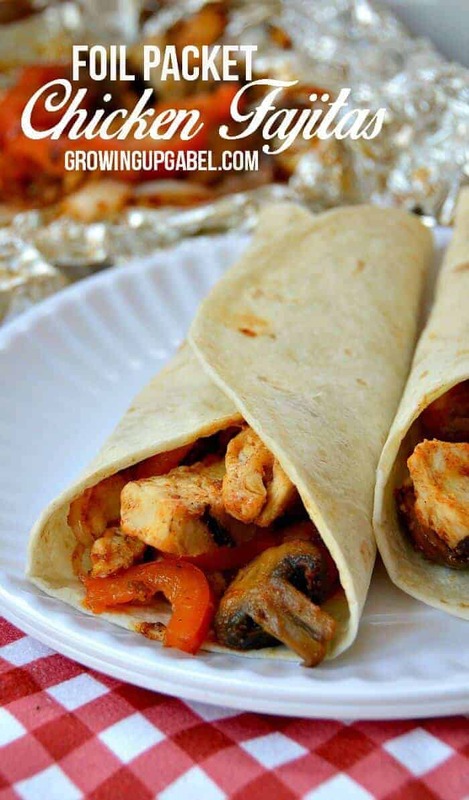 Do you see how wonderful these Chicken Fajita Tin Foil Packets look by Growing Up Gabel. They are packed and loaded with goodness and everyone can customize their foil packets to include what they like. Perfect if you have some picky eaters in the bunch. They are also so easy to cook and clean up. Just roll up the foil and you are good to go! 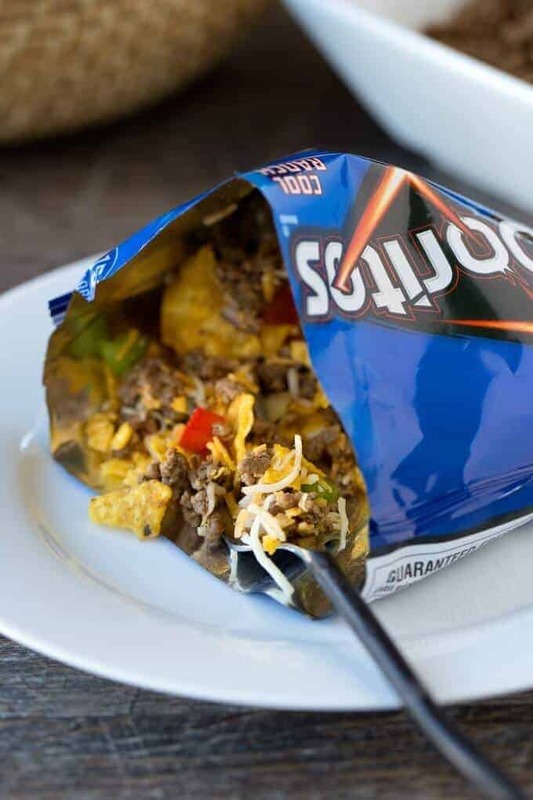 Now these Walking Tacos recipe is a super fun. Here at Princess Pinky Girl we love tacos and this Taco in a Bag is one of our favorites. It is such a smart idea for camping and any kid of any age will love it. Grab the single serving bags of chips, cook up some meat and have the toppings ready to go. You have a zero plate meal that everyone will be raving about! 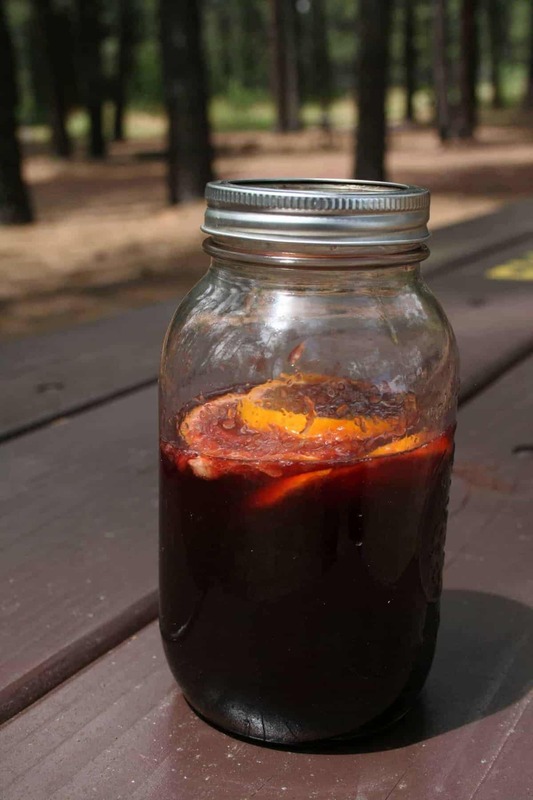 If you love to enjoy a cocktail on your camping adventure, I’d say that this camping sangria by Creating Mindfully looks like a fun one to try out. You’ll be the talk of the campsite when you have a cheerful drink to share and it looks so easy to make with a couple of large mason jars. So fun! Kitchen Fun with My 3 Sons always has something creative and totally adorable up her sleeves. 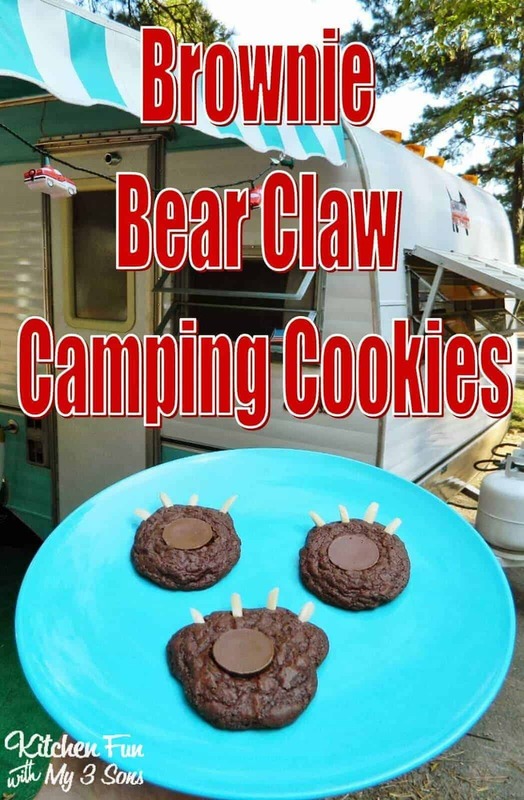 It was no surprise that she created these sweet Brownie Bear Claw Camping Cookies! How stinkin’ cute are these?! These make ahead Breakfast Taquitos from Tastes Better from Scratch are the perfect breakfast. 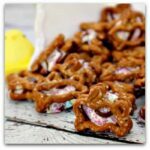 You can pretty much make them at home and then just reheat them while on your trip! So creative! I love this idea and totally want to try this. It looks delicious. ? My friends told me to check out this site. They weren’t kidding around after all.